Cherrie Mercer, Peter Mercer, Chair of the Board of Governors for Langara College Dennis Dineen, Derek Bedry, Carly Wignes, Langara President Dr. David Ross, and Nicholas Read. Photo: KK Law. 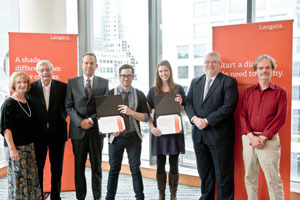 Vancouver, BC – A $1.3-million gift made to Langara College by two prominent Vancouverites that will establish two $10,000 annual scholarships for journalism students, was announced today. The endowment was bequeathed to the College in the estate of Michael Mercer, who passed away in 2010, to honour the memory of his journalist wife Jeani Read, who herself passed away in 2007. Columnist Read began her career at Vancouver-based newspaper The Province in 1973, eventually moving on to become the publication’s first full-time rock critic and, later, a lifestyles reporter. Mercer was himself a playwright and screenwriter, with credits including cherished Canadian programming such as The Beachcombers and Wind at My Back. The endowment, the largest in the College’s history, has established the Jeani Read-Michael Mercer Scholarship for Journalism at Langara. Two annual scholarships of $10,000 each will be awarded on an annual basis. The awards are to be given to successful applicants from the Journalism Program upon graduation, to provide support for approximately three months while they produce a major work of journalism. Connected to the scholarship is the Jeani Read-Michael Mercer Journalism Project Mentorship Award – an endowed honorarium that will provide funds to compensate mentors of scholarship winners. The award announcement was made at a luncheon in Vancouver on March 29th, attended by Michael’s brother Peter Mercer, Jeani’s cousin Nicholas Read, and Langara’s President Dr. David Ross. "When Michael set aside the money for these fellowships, he had two priorities,” said Nicholas Read, who is also an instructor in the Journalism Program at Langara. “The first was to honour Jeani's memory. That was more important to him than anything. The second was to help a deserving student or students get his or her first job because he knew how tough that is. After all, he'd once been there himself." The awards were established to encourage students to continue their pursuit of journalistic excellence by providing graduates with mentorship to give them a strong start in their careers. It is also hoped that the scholarship will perpetuate the legacy of Jeani Read, whose iconoclastic and irreverent columns at The Province challenged the status quo throughout three decades. "It is hard for beginning journalists to break into the business,” added Read. “Harder than it's ever been before. But these fellowships will give the students who win them an entreé into journalism that they wouldn't have had otherwise. I think that would please Jeani and Michael." "Michael created this scholarship in the name of he and Jeani, both successful writers, to aid young journalists starting their careers,” added Peter Mercer. “The foundation is a symbol of their eternal love for one another." The first recipients of the scholarship are Journalism Program grads Derek Bedry and Carly Wignes. Derek will be mentored by Yvonne Eamor, a producer at the CBC, while he works on a radio documentary project to explore untold stories about Vancouver’s affordable housing shortage. "This endowment will create important opportunities for budding reporters to pursue mentorship, and for seasoned journalists to share their knowledge and experience," said Langara's President Dr. David Ross. "We are honoured to be a part of it." Langara College, located in beautiful Vancouver, BC, Canada, provides University, Career, and Continuing Studies programs and courses to more than 23,000 students annually. The College’s expansive academic breadth and depth allows students to choose their own educational path.